What are the Best Cheap LED Grow Lights That Work for indoor marijuana growing in 2019? Your best bet will be a low wattage grow light from brands like King Plus, Roleadro, Phlizon Newest, GalaxyHydro, Meizhi, or TaoTronics. Thankfully, you don’t need to be wealthy to grow your own cannabis. These cheap LED grow lights can be obtained for under 200 bucks. Here you’ll discover the seven best all-around LED grow lights currently on the market. It’s the year 2019 and many manufacturer has worked so hard in last few years to provide better results. However, it’s important to understand the meaning of the phrase Cheap LED grow light. Cheap doesn’t mean low quality grow light. To me it means best all around quality for a fair price. Some people will recommend a $20 light simply to say it’s the cheapest, but your marijuana plants certainly won’t reward you with much from a sole 12w light. 1.5 MEIZHI 300W Updated LED Grow Light– Grow your weed with it. 1.6 Shengsite 50W LED Plant Light – Small yet perfect for one or two plant. 1.8 Our Bottomline for Best Cheap LED Grow Light Reviews. King Plus 600W is chosen as our editor’s choice as far as Best Cheap LED Grow Light is concerned. I’ve selected King Plus LED as the best due to several factors. King Plus has given several excellent variants to the community one of them is King Plus 1200W Full spectrum LED which is designed for people with a bit larger grow space. Moreover, that variant is working marvelously inside many cultivators grow space. Now, let’s get to the point and talk specifically about the 600W King plus model. 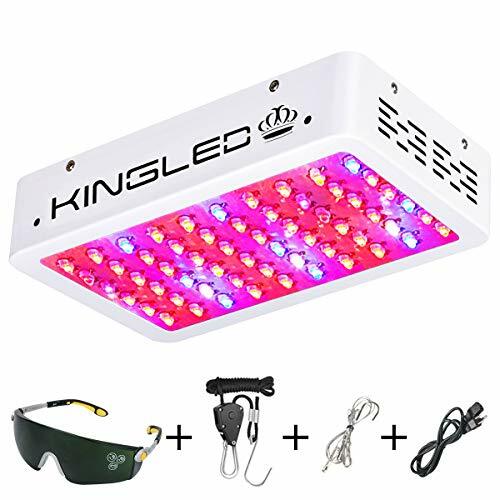 King Plus 600W This affordable grow light is equipped with 60 Dual Chip LEDs of 10W each. These LED spreads a full spectrum light all over your grow space. An underlying reason for utilizing dual chip LEDs is to produce more intense light which can balance PAR and coverage in the most efficient way possible. King Plus 600W is capable of providing the most elemental spectral effect which is suitable for all the periods of your marijuana plant’s lifecycle. The spectrum of King LED also includes IR bands which are most essential for cell building and better growth. The manufacturer goes ahead and says that it mimics the real sunlight in the best way possible. This grow light is useful and at this price your cannabis plants will flourish. It’s a win-win. Now, if you’re concerned about its ability of coverage, then it is suitable for a decent 3’ X 3.5’ of the area. Which you can increase or decrease based on your requirement and your observation. If you’re looking for an affordable grow light, chances are you’re only growing a couple plants anyway. What we recommend is to keep the light a bit nearer to the canopies during flowering so that your plants can absorb more light and produce better buds. King Plus states that this light can replace a 600W HPS system. However, we don’t believe in this replacement factor. Moreover, we recommend our readers to look at actual power consumption rather than looking at this crap HPS figure. 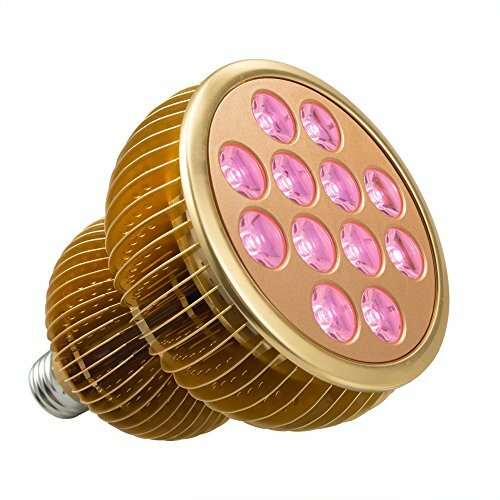 This cheap 600W Variant of King Plus LED grow light pulls 120W from the power outlet which justifies its energy efficiency capabilities. 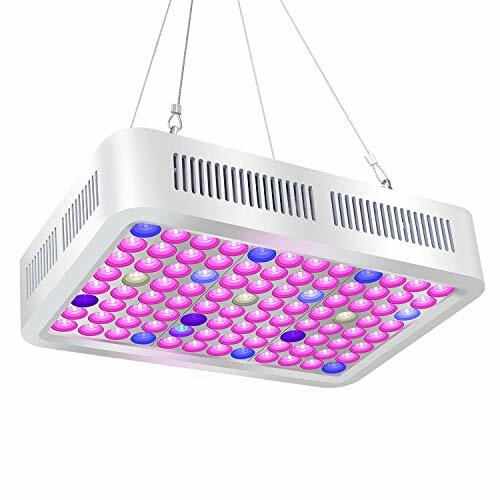 As far as temperature management and heat dissipation are concerned, this grow light is equipped with multiple cooling fans that keep things well balanced inside one’s weed grow space. In case you face any problems, or any failure occurs King Plus provides a generous 3 years of manufacturer’s warranty. A good thing about King Plus is usually, they respond to their customers within 24 hours and guides them through the process concerning warranty claims. That’s all for King Plus 600W LED Grow Light. Now let’s take a brief look at its benefits and drawbacks to make your decision-making process smooth. One of the best affordable LED grow lights on the market. Capable of providing marvelous light spectrum to the weed plants. Highly energy efficient that saves money in longer run. Sturdy build and attractive design. I wanted to confirm whether all these stats about coverage, power draw and spectral abilities are right or wrong? After all, for a generous entry level price these are impressive stats. So, I took the opinion of several existing users who are currently growing using King Plus 600W LED Grow light. So, based on these responses, we could confirm that King Plus 600W Full Spectrum LED grow light is one of the best Cheap LED Grow Lights that works well for indoor cannabis growing. Buying King Plus 600W LED Grow Light is the best bet if you want the best LED Grow Light for the money you spend. And, you want a similar grow light in terms of capabilities then Viparspectra 600 Watt LED Grow Light is also a great alternative. However, for Viparspectra you might need to stretch your budget further to above 100 dollars. To conclude, the meaning of CHEAP is apparent that it shouldn’t correlate with CRAP. The King Plus 600w grow light is a cheap grow light that works well. Don’t take it from me, take it from verified owners’ reviews. With over 1,000 reviews and high average rating, I discovered they’re all saying things like “bang for your buck,” “highly recommend,” and “third grow with nice buds and no complaints.” How can you argue with that? If you don’t find it fits your needs then no worries. Let’s move forward to another LED grow light that works like a charm. Another great cheap LED grow light candidate is the Roleadro 800w COB LED light. This is an LED grow light manufacturer that’s been selling well for a while now. Roleadro had provided some charming piece of satisfaction for money savvy and budget bound people. Moreover, this COB variant from the manufacturer is one of the Best COB LED grow lights by Roleadro. We are considering Roleadro 800W COB grow lightdue to several obvious reasons. The COB technology is a key differentiator on entry level lights. So, let’s explore what’s in there for this grow light to be worth purchasing. This LED grow light is equipped with two large COB CREE Chips. Yeah, it’s a combination of multiple chips which helps in generating extraordinarily intense and more focused light. The shade of light in this grow panel is pinkish, and it covers all the essential bands of vital spectrum for your marijuana plants. Your plants will get everything they expect from nature. Also, above all this spectrum is suitable for the entire growing cycle of your cannabis plants. Now, if you’re concerned about coverage abilities then don’t worry it’s capable enough to cover around 3’ X 3’ of growing space with ease. However, as we always say, it’s up to you to increase or decrease this space by adjusting height. Just as a reminder, don’t forget to keep it a bit close during flowering to gain more resinous buds. This grow light also features daisy chaining ability that lets you connect another grow light without the need of an extra socket in your power outlet. In case you want to expand grow space, this feature comes handy. Due to COB integration, Roleadro 800 Watt COB LED grow light effectively improves the uniformity of brightness and yeah, good PAR helps in increasing yield. Now, comes the main thing to look for in a cheap grow light and that’s the actual power draw. Moreover, as far as this factor is concerned, we’d suggest you to be worry-free as it only pulls around 200W from the wall. Roleadro ensures the safety of your plants by placing multiple cooling fans along with an advanced heat sink. Yeah, heat dissipation should not be an issue anymore. For customer convenience, they also provide 30 days money back guarantee along with 2 years satisfactory customer warranty. We’d again like to state in this cheap led grow light reviews, that all figures are gathered using the opinion of existing users who are actively helping the community on several forums and social networks. To make things easy let’s take a quick look at Pros and Cons of Roleadro 800W COB LED Grow light. An Affordable LED grow light that works. Use of State of the art COB technology. More intense and focused light. Energy Efficient Lighting for Marijuana plants. Lacks dual mode switching, although the light is sufficient for all growth cycles. Looking at all these abilities and features of this marvelous 800W COB LED grow light by Roleadro, it’s a sure thing that it has something great to offer its customers regarding healthy and well-grown plants. Yeah, with all its abilities to perform at its best inside your grow space it’s a wise move to buy this cheap led grow light by Roleadro. One thing that we all agree on is our plants crave for the best quality of light and hate excessive heat. Right? This beast by Phlizon is the one of the best cheap LED grow lights at an entry level price. This affordable grow light comes with full spectrum lighting capabilities along with thermometer and humidity controller as freebies. Let’s explore this grow light in detail then. A beautiful thing about the Phlizon 600w LED grow light is it does not use reflector and gives a good justification for not including it in Phlizon Newest 600W’s design. Phlizon aimed to provide safety along with satisfaction rather than delivering beauty with a headache. Now, if we talk about light spectrum abilities, then this grow light provides with a full spectrum light output which further includes IR and UV in it. The IV and UR lights boost the leaf building and germination process of your marijuana plants. Phlizon Newest 600W LED Grow Light comes with dual mode switches which come handy when your plant move from vegetation to the blooming phase. As usual vegetation mode will spread blue light among with white, IR and UV while bloom mode will help your plants get a quick boost with the help of Red light along with white, IR and UV. As far as coverage is concerned, Phlizon Newest 600W is capable of covering a decent grow space of around 2’ X 2’ for the entire grow cycle of your marijuana plants. This grow light eliminates reflector design and features a mixed angle of 90 and 120 degrees in LEDs. If we don’t consider HPS replacement figures of 400W, then this grow light pulls 108 watts from the wall which is fabulous. Yeah, it’s an ultimate power saver when it comes to actual power draw and performance. Now, if we talk about cooling and heat dissipation inside your grow space, then this grow light does an incredible job in maintaining temperature. Yeah, as we said earlier, they’ve focused on safety first instead of focusing on beauty. They provide a digital thermometer and humidity controller in the box itself which will help you in keeping an eye on your plants movement. 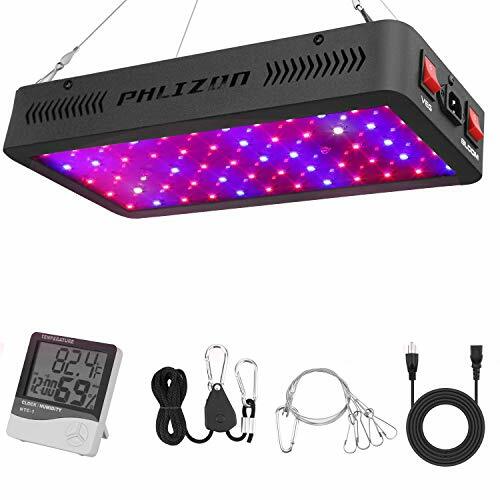 For user convenience and satisfaction Phlizon offers a 30 days money back guarantee on its LED Grow light along with a 2 years warranty period. All in all this feature makes it a definite Best LED grow light for the money you’d spend on it. Let’s take a quick look at the pros and cons of this cheap LED by Phlizon. Value for the money grow light. Well Suited spectrum for marijuana plants. Decent Coverage in the segment. Energy efficiency that helps in long run. Safety glasses are recommended when be in direct contact with light. Warranty : 2 Years warranty + 30 Days Money back if not satisfied. Looking at all the features and capabilities that Phlizon has to offer we can consider it as one of the best cheap yet performance packed LED grow light in the best budget segment. Moreover, we’d recommend buying Phlizon newest 600W to the people who have the budget under 100 dollars and wants to purchase a cheap LED grow light that has solid all-around value. Don’t be surprised to see another grow light from Roleadro. It has all the abilities to justify its place on the list of some of the cheapest LED grow lights on the market. As we already talked earlier, Roleadro is a well-known manufacturer when it comes to grow lights. They’ve improved their standard of quality during their 8 years as an LED grow light manufacturer. As far as GalaxyHydro series is concerned their two variants are doing pretty well on the market. If you’re keeping a small marijuana grow space you may be able to get away with the 300w model and save even more money. Being specific for the Galaxyhydro 600 Watt, this grow light is marvelous when it comes to performance. Yeah, that’s why we count it in one that works in indoor growing pretty well. GalaxyHydro 600W uses high quality material which makes it durable and capable of performing for more extended period. They’ve equipped this grow panel with 60 LEDs of 10W each which spreads an extraordinarily bright and intense light all over your grow space. Now, if we talk about light spectrum, the 600w model is up to the mark because all essential light bands required for your plants have been covered including IR and UV. The fabulous thing about the GalaxyHydro 600w is that it has a compelling ratio of Red bands which boosts the growth of your flowers in a tremendous way. Unequivocal support to your plants concerning spectrum that’s what GalaxyHydro is famous for. Now, let’s talk a bit about coverage ability. As long as you’re planning to grow in an area of around 3 sq ft. you should be good to go. Yeah, during veg it is suitable for around 3’ X 3’ of space. On the other hand, during flowering, you’ll have to decrease height from plant canopy, and in such case, it’ll still be able to cover around 2’ X 2’ of the area with ease. In addition, the GalaxyHydro 600W LED features daisy chaining as well. Yeah, at this price mark it might not be top on the grow light section concerning performance, and we shouldn’t expect that. However, one thing is clear that it does what it is supposed to do. If you’re afraid of power consumption with GalaxyHydro 600W Grow light, then your fears are misplaced because it’ll pull around 132W from the wall, which is more than acceptable from any grow light. Inclusion in the list of Top rated cheap LED grow lights doesn’t mean that it’ll be power hungry. Now, comes the most crucial aspect to consider while buying an LED grow light, primarily when we deal with affordable and cheap LEDs on the market. It’s the temperature balancing, and heat dissipation abilities of the grow light panel. We’ve taken opinion from the people who’re currently growing great using this grow light. They’ve also explained how it works regarding the temperature balancing. It keeps your grow space well balanced concerning heat and cold air. 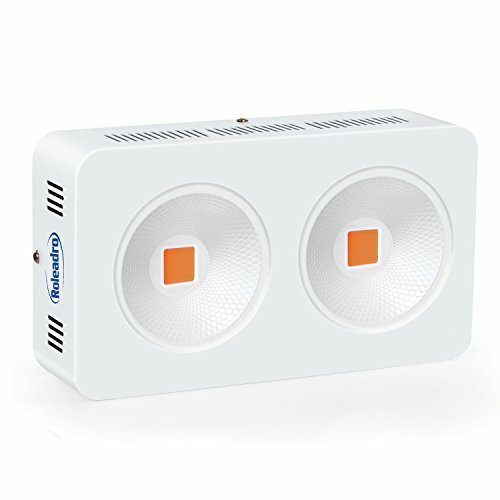 Roleadro equipped this grow light with multiple cooling fans, aluminium heat sink and a built-in temperature controller which keeps an eye on it while working. When it comes to customer support, Roleadro provides a generous 2 year warranty and a 30 day refund policy if their product fails to satisfy the needs of their customers. Now, it’s time to take a quick look at its pros and cons to help you make the right decision. An Affordable Grow Light known for performance. Panel protector zener diode for safety. Power efficiency at its best. Keeps things balanced in terms of temperature and heat. Don’t forget to look at Special Offers and Product promotion section when you buy from Amazon. Who knows there might be some offers waiting for you. Looking at its abilities, performance and customer satisfaction ratio, we would surely recommend the GalaxyHydro 300 Watt LED grow light. 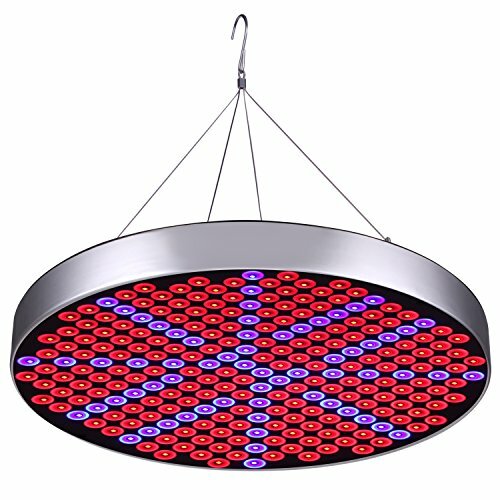 It’s definitely a good value if you’re searching for a cheap LED grow light that’s entry level. MEIZHI 300W Updated LED Grow Light– Grow your weed with it. The last 300w LED grow light on our list is made by Meizhi. This brand is known for their budget-friendly grow lights. The cool thing about this variant is it’s an updated version of their old 300W LED. As we all know each update comes with some cool abilities and improvements. Each manufacturer wants to hold their position on the market by providing performance-oriented products to the customers. In this case they’ve improved their product quality compared to the old one. Let’s explore what this cheap LED grow light has to offer to its customers. This updated grow panel by MEIZHI is equipped with 60 LEDs of 2W each. We agree that it’s very low on each LED, but they’ve improvised their design quality to produce more power regarding the light. On the other hand they’ve used EMC technique for LED placement which seems to be effective. Yeah, they’ve eliminated plastic and glass reflective panel and equipped this grow light with an advanced reflector that helps it to spread the light all over the grow space evenly and effectively. If the spectrum is a concern, then it’ll spread a range of band from 450 to 660nm including white and 2 PC of LEDs that will sprinkle a hint of IR as well. Now, comes the coverage ability by MEIZHI 300W LED Grow Light. Yeah, it can cover a space of around 3’ X 2’. However, we’ll recommend to reduce it a bit further and try to achieve coverage for 2’ X 2’ of the area only. Yeah, that’ll be a wise move concerning plant productivity and growth. When it comes to power consumption MEIZHI states that their 300W grow light has an actual power draw of 140 Watt, Which will further help you in saving money in the long run if you’re running tight on budget. MEIZHI 300W UPDATED Version of LED grow light comes with separate mode switches. Also, daisy chaining feature which will help you to attach another grow light in future if you plan to extend grow space. Single cooling fan and an aluminum sink help for keeping things balanced. However, it’s recommended to supplement your grow space with some external cooling mechanism as well. Especially if you’re planning to use multiple grow light in your grow space. As far as customer convenience and support is concerned, MEIZHI offers 30 days refund policy along with 2 years warranty where for the first year they’ll replace the product on their expense and for the second year you’ll have to pay for shipping rest they’ll repair your product and ship back to you. That said, Meizhi claims the damage rate is close to 0 and looking at product reviews it seems to be true. Take a quick look at the advantages and disadvantages of this grow light by MEIZHI. It’ll help you in making a smart decision. Cheap Yet Effective LED Grow Light. More than 85% of happy customers is an achievement in itself when it comes to affordable and cheap products. 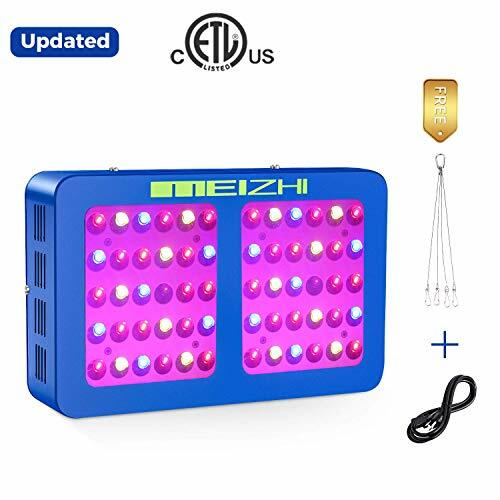 If you check out the reviews on Amazon for the Meizhi 300w grow light, you’ll understand this is a quality light. Many manufacturers claim that they’re providing top rated and best cheap led grow light under 100 dollar budget. However, when it comes to reality, it becomes a nightmare for many. Because such product starts harming plants after using for few months or maybe for a few days even. Yeah, Meizhi Updated 300W Variant is worth your money if you have a grow space of around 2’ X 2’ and don’t want to spend much for premium LED grow lights such as Advanced Platinum or Grow Light By G8LED. Shengsite 50W LED Plant Light – Small yet perfect for one or two plant. If you’re hunting for a grow light for only a couple of plants and you’re confused, say no more. We’ve included this grow light by Shengsite in our cheap LED Grow light review. It justifies its place in this list of affordable LED grow lights with some nice entry level power, and fantastic user reviews. This 50w grow light has been rated hundreds of times and owners gave it a high star ranking. Now that’s bang for your buck. Of course consider this light is only good for 1-2 plants at best. This circular panel comes with 250 LEDs and with a great Red: Blue ratio. Yeah, it’s 3:1, which is more than enough to grow your cannabis plant well and provide some great result concerning more massive flowers. Shengsite 50W Slim Panel is one of the cheapest LED grow light with only two bands. Although not full spectrum, these two bands are enough if you’re starting out in indoor growing. It’s recommended to keep light closer to your plants to achieve better results. However, keep an eye on plants growth and movement for some initial days and change it accordingly if it’s harming your plant in any manner. As the title of this LED Review suggests, it is suitable for maximum of 2 plants. Moreover, we’d not recommend it to you if you’re planning to buy a light for 3 or more than that number of plants. Now if you’re worrying about Power efficiency, then this grow light pulls around 50W from the wall which is acceptable from a grow light in this price segment. However, this low power consumption will not compromise on luminous energy which is a game-winning factor when you grow indoor using LED grow lights. It has a lifespan of around 50,000 hours as per manufacturer’s specification details on the product. In case, you’re feeling sceptical for this grow light panel then you should try it at least as the manufacturer provides 30 days money back guarantee in the rare case, you don’t satisfy with their product. Yeah, 100% amount will be refunded by the manufacturer. It comes with a warranty period of 12 months. However, very few cases are seen where consumers have to claim their warranty. Cheapest LED grow light yet effective for 2 plants. A decent warranty period in the segment. Doesn’t feature a full spectrum light. If you’re a new grower and want to experiment in indoor growing, then this grow light by shengsite is for you. In case you’re planning to use it as a supplementary grow light in larger grow space then also it’s a good grow light as far as you use it for blooming. However, if you’re planning to grow in a space more than 9 sq.ft, then you should take a look at our reviews for best 600W LED Grow lights. With around 90% of satisfied customers, this tiny beast is rocking onthe floor of LED Grow light market. Yeah, this TaoTronics 36w LED grow light has created some wonder for many single plant cultivators. TaoTronic LED Bulb comes with full spectrum light and 12 3w LEDs. You’ll notice the majority of the Red range as it has included Pink as a band in its design along with red. Yeah, and another one is blue which is necessary for any plant in its initial growth. Extremely easy mounting makes it massively user-friendly. Yeah, no need of any separate mounting. Just plug it in your bulb holder and boom. It’ll start spreading efficient light on your plant. A reflective pattern on the bulb surface helps in achieving higher penetration rate. It emits light which is highly absorbable and boosts the process of photosynthesis. People who are looking for a tiniest yet effective light for their single plants, This is a light that you should consider in your list. But let’s be honest. It’s one of the smallest cheap LED grow lights out on the market. For a few bucks more you can probably get one of the other grow lights mentioned above, and have a significantly larger grow space with better yield. This cheap LED grow light is only good for one plant. A few extra bucks will take you a long way in this case. No features – bare bones. What are you waiting for? Our opinion? Our Bottomline for Best Cheap LED Grow Light Reviews. In this review, we’ve researched each product thoroughly to help our readers in selecting some real value for the money LED Grow lights. We’ve considered all the possible option available in this segment and then filtered some golden masterpiece out of an extensive list of available products. Yeah, by comparing it with each other, by asking people who bought those products in the past. Grow light reviewed in this article are suitable and limited for maximum of 3′ X 3′ of grow space. However, for further expansion one should look for a grow light with daisy chaining ability or should opt for a one which has ability to cover more space. For example the BestVa DC 2000W which we won’t recommend you to go for if you’re just starting into indoor growing. People who are interested in growing marijuana indoor for the area of around 3’ X 3’ with some high performance yet affordable grow light should consider following 3 in their priority list. If you’re looking for a grow light which has a bit less coverage ability, then go for following two LEDs. Now, if you’re running too tight on budget and don’t want to spend an amount over 50 dollars then go for the following two masterpieces.